A newly-unveiled PS3 accessory will make MMOGs on the console much more appealing to PC gamers, but other users might be turned off by the controller's size and looks. Sony has a couple of big MMOGs coming to the PS3 in the near future, primarily DC Universe Online and Final Fantasy XIV. 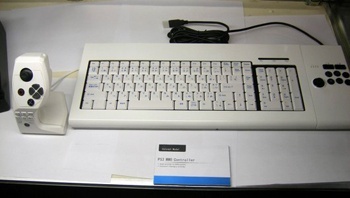 While the games are designed to be playable on the PS3's default controllers, at least one peripheral manufacturer believes that console gamers are going to want a full-sized keyboard to use, and had a keyboard/controller hybrid for the console on display at E3. While wandering the show floor, Joystiq's JC Fletcher spotted the device and snagged the photo at right. The "PS3 MMO Controller" is massive, and more than a little ugly, but it certainly looks like it'd be an effective way to play an MMOG on the PS3 and communicate with your friends/teammates. That said, I'm not really sure a lot of gamers are going to want to invest in something this bulky as a console accessory. The unit on display is actually a concept model, so nothing is set in stone right now. That also means that Hori has yet to confirm anything definite like a release date or a price. This kind of a device seems like a bit of a gamble, since some MMOG developers are making an effort to create gameplay that's actually intuitive to console controllers and bypass the need for a device as massive as this. That said, the controller will certainly make in-game messaging a lot easier.